Panromantic/Pansexual, kind of leans toward women. Christmas, gingerbread, decorating cookies, snow, sleighs, bells, candy, sitting by the fireplace, drinking, C H A O S, spreading Christmas cheer!! Ungrateful people, Grinches, summer, healthy food, boredom, stagnation, large carnivorous animals. Charity seems straightforward at first; she's cheerful, generous, and loves to spread joy. However, after being around her for a while it becomes apparent that Charity has an insatiable lust for chaos and a complete disregard for the feelings of others, like some kind of adorable Christmas genie. 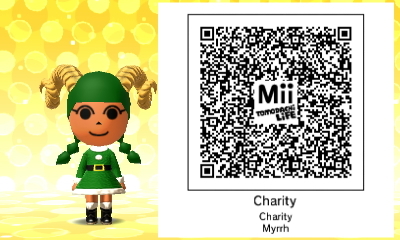 Charity spends her days wandering across Entirety, teleporting to different Realities and granting Christmas wishes. However, there's a catch: the wish only lasts for Christmas day and no matter how drastic the wish was - someone could wish to conquer the universe or turn everyone into cute puppies - everything will go back to normal the next day. Everyone involved will remember the day's events, for better for worse... often for worse, since Charity tends to grant impulsive wishes and likes to seek out exciting (read as: dangerous) people to grant wishes for. She likes to watch people run around on chaotic adventures like it's a TV show, and sometimes she'll even join in and help out! She isn't all bad, though: she'll grant wishes, she just tends to twist them to make them more exciting. You'll get your video game system, but you'll have to fight some kind of wacky Christmas dragon to take it from its horde. You'll get world peace, but you'll have to keep all of the forces of evil at bay for the day using nothing but a candy cane. You'll get to hold your crush's hand, but only after rescuing them from a gingerbread military compound. And the hand might not be connected to their body. If she's entertained enough and the wish was small-scale enough, Charity will often let the wisher keep whatever they earned into the next day, but other times the wisher will have to struggle and suffer for nothing. She does seem to have an earnest desire to give people what they want the most, but her amusement is always top priority. Her powers warp reality to a remarkable degree, able to impact Entirety as a whole for the day. Because of this Charity is considered a top threat by most intergalactic organizations, especially the Space Police. She's incredibly adept at avoiding capture though thanks to the fact that she has absolute power on Christmas Day, and if it's not Christmas in one Reality she can always hop to one where it is... or just ask her girlfriend to make it Christmas. If there is any being capable of stopping or defeating her, they haven't made a move. Entirety is at her frosty, Christmas-themed mercy.